Prep continues here at Team Hodge. 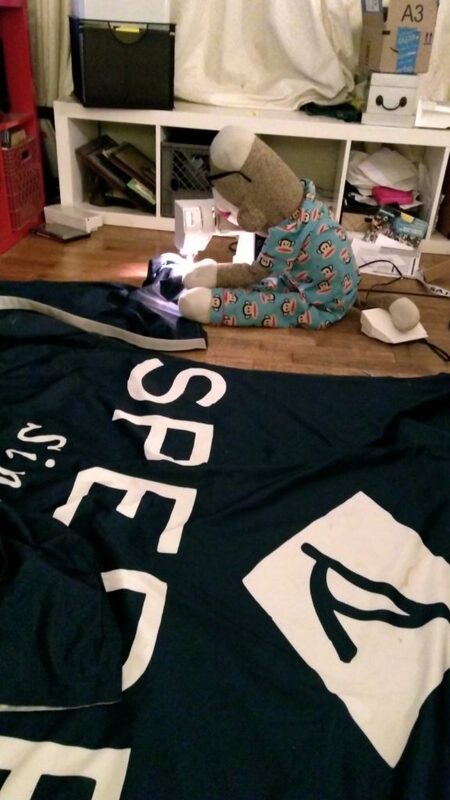 The Sperry flag from 2016 will be returning, reincarnated as a boom tent. This really has been George’s project; since he ends up staying at the boat alot at events like this he wanted some shade. We just need to add some grommets and some straps to hold it to the boom, and it’ll be good to go. In other projects, I’ve re-routed the lines and moved the clam cleats to make room for our new snubber winch. 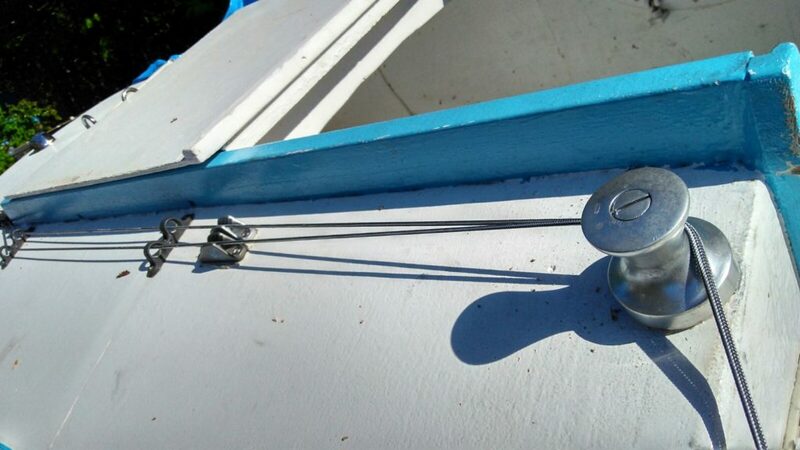 This new arrangement should be an improvement for the downhaul and halyard lines. The other major project that got done today was the electronics charging box. 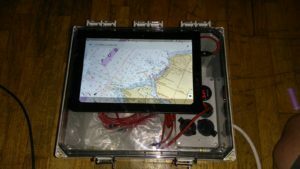 The intent of this is to have a waterproof enclosure that I can charge a cell phone, a VHF handheld, and a viewable tablet chartplotter. This is an outgrowth of my waterproof electrical system on the Minnow. 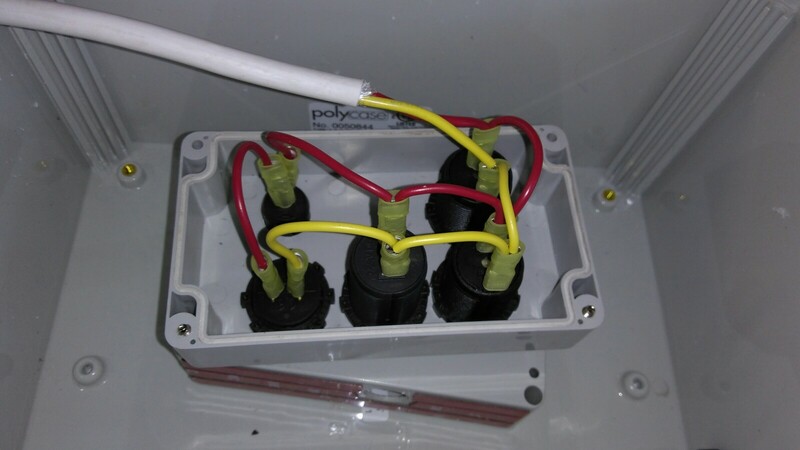 It plugs into the breaker panel, however in a pinch it can be unplugged from the breaker panel and plugged directly into the battery bank, in case of failure in the boat’s electrical distribution system. 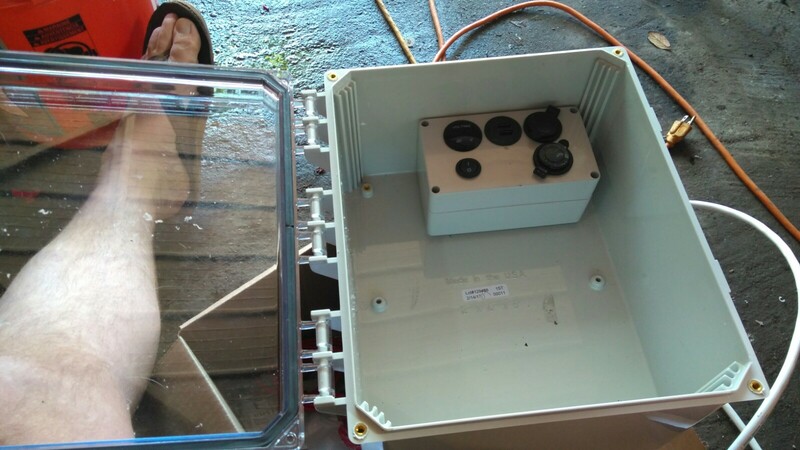 I started out with a large waterproof NEMA enclosure. 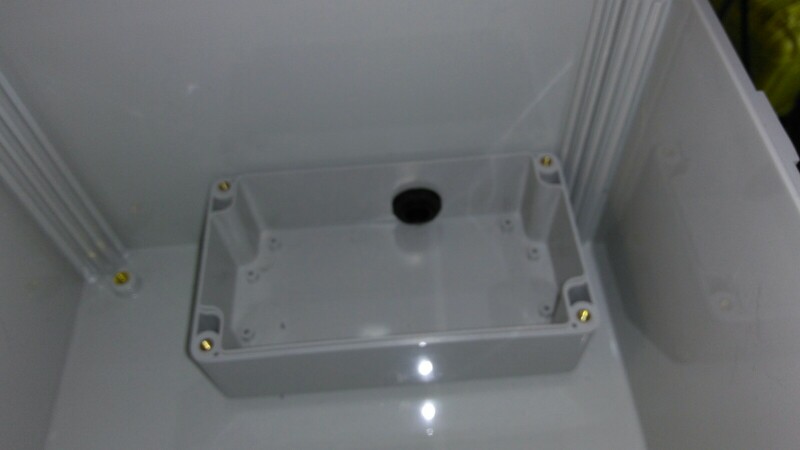 This is the same brand and style of box as the breaker panel enclosure I have in the minnow, but larger. Inside of this, I fitted a small project box. 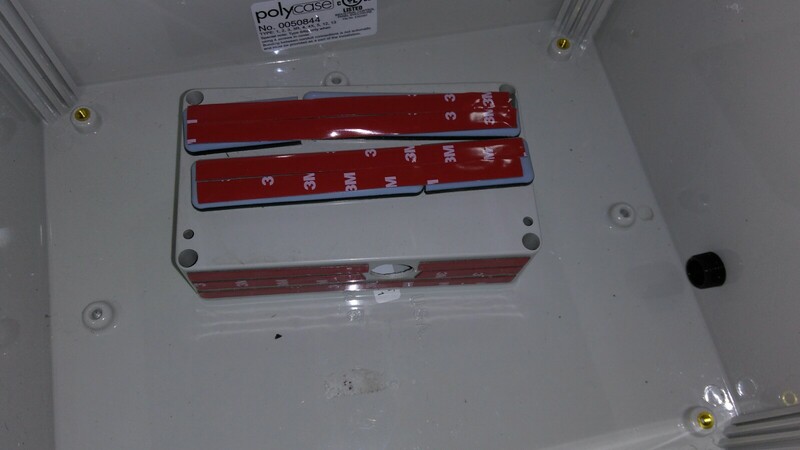 The bottom half was attached to the bottom and side of the NEMA box with leftover 3m doublestick foam tape from the LED lighting project on my Catalina 30. to avoid the nubs cast into the outer box, I had to space up the project box off the bottom of the NEMA enclosure using some plastic bits I got from the hardware store. I drilled and tapped a hole in the side of the outer box and the bottom of the inner box. Once the inner box was stuck down, I put the jam nut on the inside of the inner box. Then, the wiring began. I planned to have two 12V ports, and two high amperage USB ports, along with a LED voltmeter on a switch. These components were fitted into the top half of the inner box, so that all I had to do was feed the wire out thru the gland nut in the side of the box, then screw the top down. Here’s a picture of the inner box, finished and competed. Inside this box, I also will carry those big EVA-DRY dehumidifier silica desiccant packs to soak up any moisture that gets in. 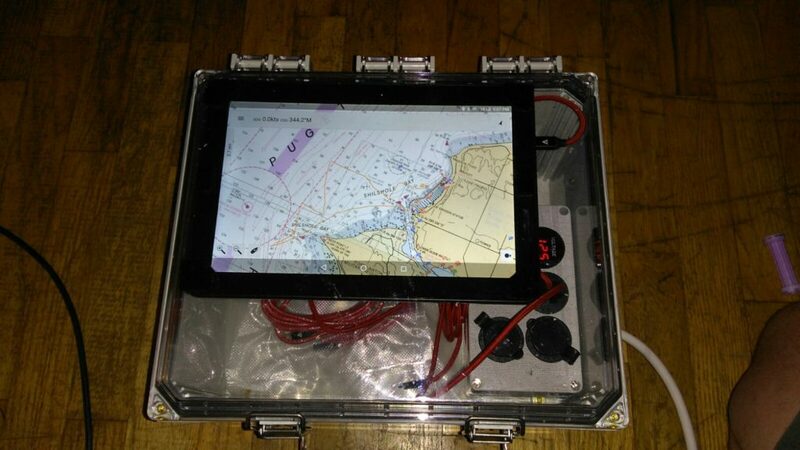 The chart plotter tablet is attached to the top of the box with Velcro; It can be put into follow mode and buttoned up dry and tight, while plugged into the charger. This is set up to charge my VHF; I had hoped to carry a second VHF inside the box and swap back and forth as needed; but this may not end up happening. I may get a remote microphone and feed it out thru a port so that I can operate the radio while it is on the charger.